Don’t be afraid of Pre-Production! Thanks to everyone who signed up for the Beta Tester program. The Beta Test program is underway and we’re looking forward to expanding the Beta program and bringing you a new piece of the very best in film production software solutions. The Making of a Horror Film! I want you to know I’m a huge fan of Power Production Storyboard Quick! !, I’m a spanish indie film maker and my last short film is called VERONICA. It’s a horror short movie, a “demo movie” for a full length picture I have in mind. My short film, VERONICA, was entirely storyboarded with StoryBoard Quick! !, and I’ve to tell you it helped me a lot and my crew was blown away with the storyboards I presented. I’m one of those directors who like to control every aspect of the project… and your wonderful storyboard software allowed me to show what I had in mind…. Thanks Power Production because I, like many other directors, can not draw to save my life… and SBQ has given me the solution I was looking for. We’d love to hear what YOU are working on as well…so if you have something in the works you think people should check out, hit us up! 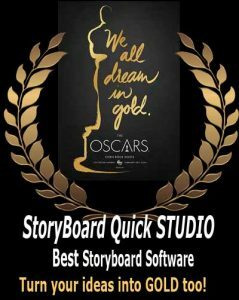 Hi, I’m Manuel León Caballero, the director of VERONICA shortfilm, and I’d like to tell you what was StoryBoard Quick’s role in this project. Of course I used SBQ to make the storyboards for this shortfilm of mine, but there is another thing maybe someone could be interested to know about the benefits of working with this software. … but, and here comes the sad thing about this story, remember I said “lucky” about getting that production company interested in producing my horror project?, well, it was never done with them. In fact, the VERONICA project is still searching to get financial support. But the whole thing about this story I wanted to share with all of you is that I was able to make a whole feature film’s storyboard project on a deadline. And although the final project could not be done, the storyboard project was finished brilliantly an delivered on time!!! SBQ is that good! !